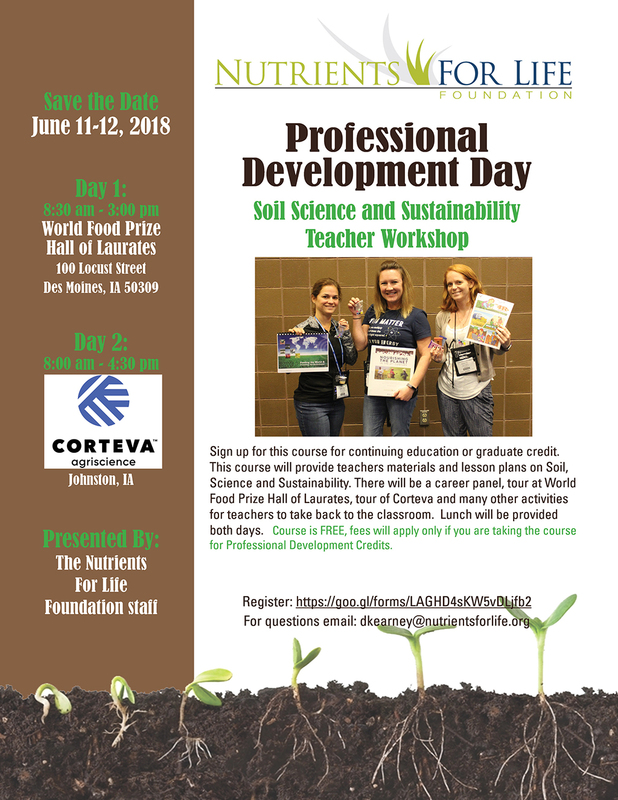 Save the Date for the June 11th and 12th, 2018 for NFLF’s Professional Development day focused The Nutrients for Life Foundation team is coming together to provide this innovative Professional Development class. The two day event in Iowa will meet at The World Food Prize Hall of Laureates in Des Moines on the first day and dive deep into the resources and curriculum that can be integrated easily in the classroom. The second day will be at DuPont Pioneer in Johnston where part of the day a career panel will share about stem careers. Teachers will receive free resources and lesson plans on Soil, Science and Sustainability. The class will be available as graduate, as well as license renewal credit. Email dkearney@nutrientsforlife.org for any questions. A full detailed schedule of the event will be coming soon. Click here to add your name to the list to get a reminder when registration opens.